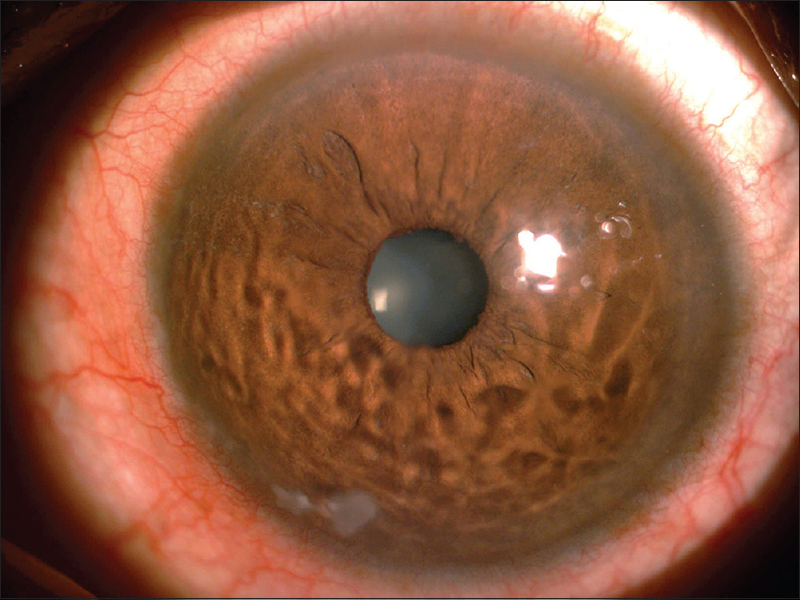 Corneal cross-linking (CXL), introduced by Wollensak et al. 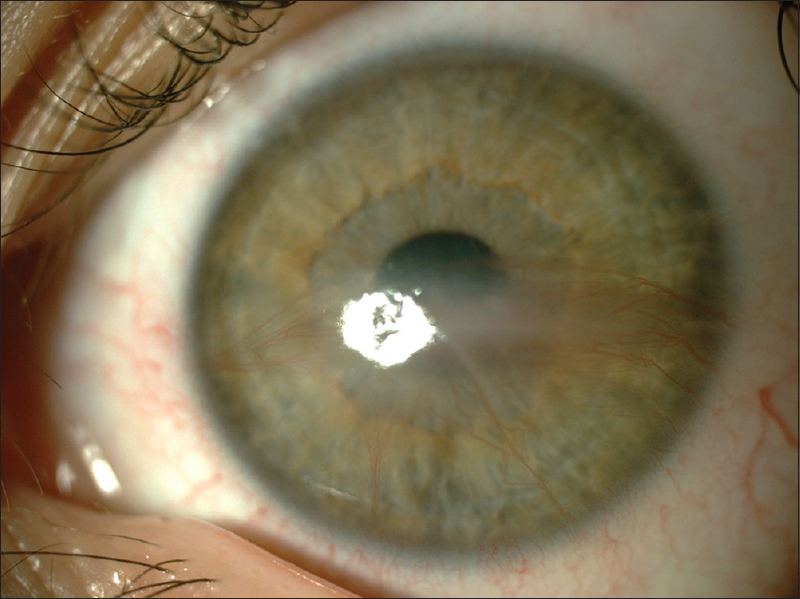 in 2003, is a minimally invasive procedure to halt the progression of keratoconus. Conventional CXL is recommended in eyes with corneal thickness of at least 400 microns after de-epithelialization to prevent endothelial toxicity. However, most of the keratoconic corneas requiring CXL may not fulfill this preoperative inclusion criterion. Moderate-to-advanced cases are often found to have a pachymetry less than this threshold. 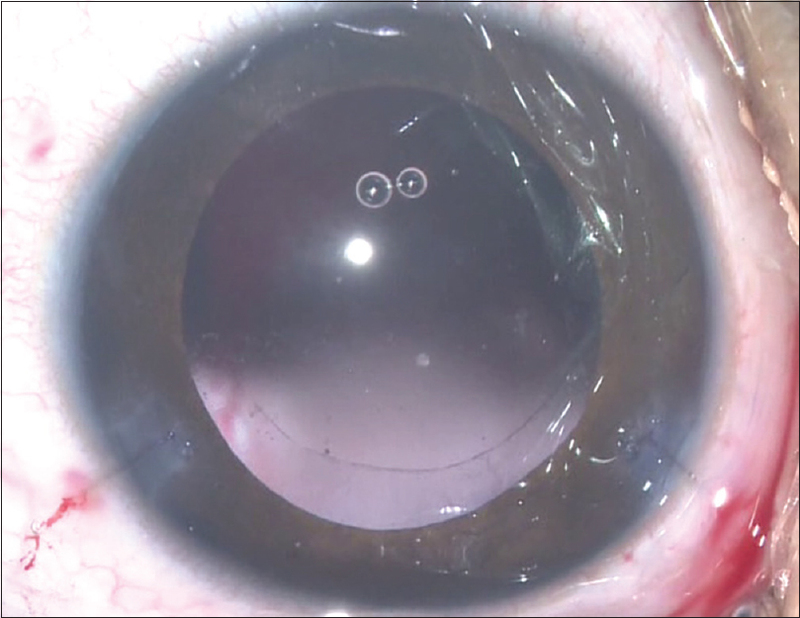 There are various modifications to the conventional method to circumvent this issue of CXL thin corneas while avoiding the possible complications. 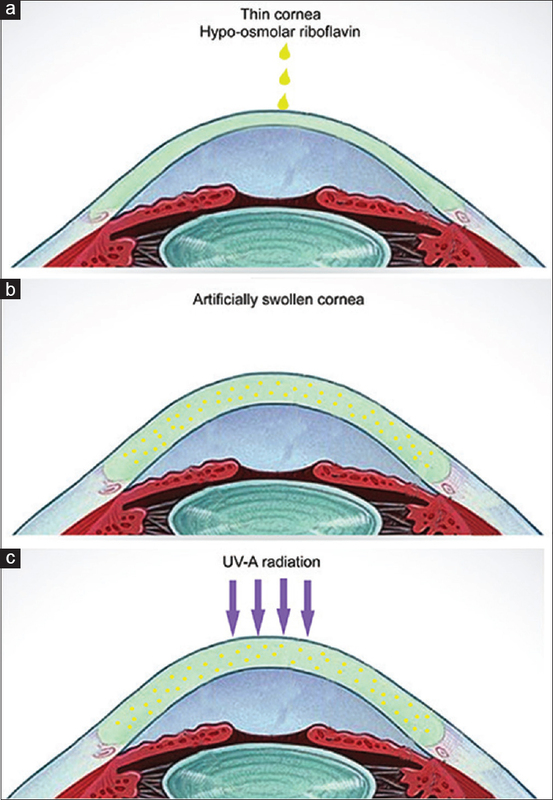 This review is an update on the modifications of conventional CXL for thin corneas. Duane retraction (or co-contraction) syndrome is a congenital restrictive strabismus which can occur either as an isolated entity or in conjunction with other congenital anomalies and is now listed as a congenital cranial dysinnervation disorder. It is characterized by co-contraction of horizontal recti on attempted adduction causing globe retraction along with variable amounts of upshoots or downshoots. It may have limited abduction or adduction or both and present as esotropic, exotropic, or orthotropic Duane. The diagnosis of this disease is usually clinical. However, recent research has provided a greater insight into the genetic basis of this disease paving a way for a greater role of genetics in the diagnosis and management. This disease can have a varied presentation and hence the treatment plan should be tailor-made for every patient. The indications for surgery are abnormal head posture, deviations in the primary position, retraction and narrowing of palpebral aperture and up- or downshoots during adduction, and sometimes also to improve abduction. The arrival of newer surgical techniques of periosteal fixation (PF) of lateral rectus (LR), partial vertical rectus transposition, or superior or inferior rectus transposition in addition to LR recession with Y-split has vastly improved the management outcomes, providing not only primary position orthophoria but also increased binocular visual fields as well. Visual electrodiagnostics and eye movement recording are important additional clinical tools in evaluation, diagnosing and management of ophthalmic and neurological disorders. Due to their objectiveness and non-invasiveness they can play an important role in pediatric ophthalmology. The WSPOS (World Society of Pediatric Ophthalmology and Strabismus) consensus statement gives insight into basic principles and highlights the clinical application of both visual electrodiagnostic tests and eye movement recording. 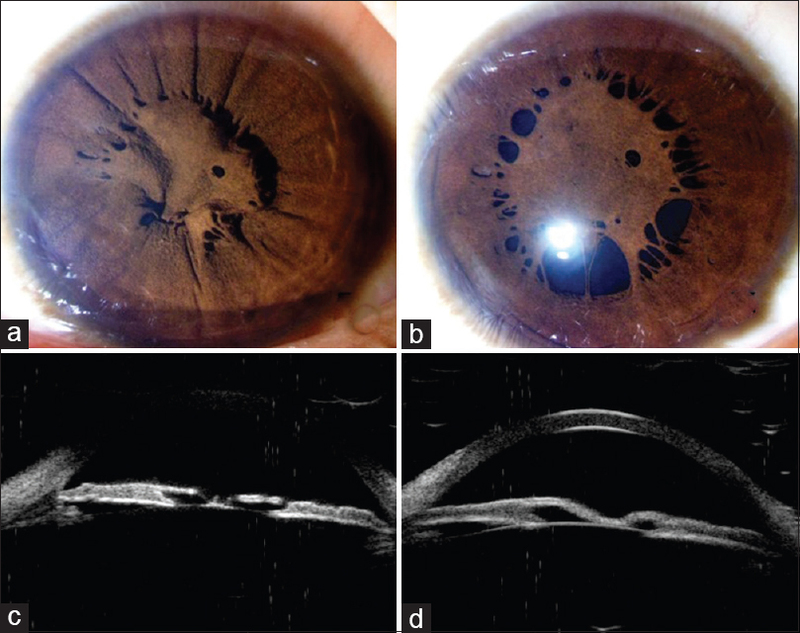 Purpose: Limbal ischemia is an important prognostic factor in the management of ocular burns. In this study, we evaluated the reliability of clinically assessing limbal ischemia among ophthalmic professionals. Methods: This study included 111 ophthalmic professionals who were shown 12 diffuse illumination color slit-lamp photographs of eyes with recent chemical injuries. Respondents were asked whether the photos were assessable and if yes, then to indicate the presence, location, and grade of limbal ischemia in each case. The responses were collected using a standard data collection sheet and the inter-observer agreement was calculated. Results: All participants responded to every question. Of the 1,332 responses, images were deemed assessable in 1,222 (91.7%) instances. The overall agreement (Fleiss' kappa) for the presence of limbal ischemia and severity of limbal ischemia was 0.106 and 0.139, respectively (P < 0.012). Among the four groups of observers, practicing cornea specialists displayed significantly (P < 0.003) higher kappa values (0.201–0.203) when compared to residents (0.131–0.185), fellows (0.086–0.127), and optometrists (0.077–0.102). All indicated a poor level of inter-rater consistency. Conclusion: The results indicate that clinical assessment of limbal ischemia is highly subjective and there is lack of reliability even among cornea specialists who regularly manage patients with ocular burns. A non-invasive, standardized, objective, accurate, and reliable modality for ocular surface angiography is desperately needed for proper assessment and prognostication of ocular burns. Purpose: To determine the levels of dopamine in tear fluid and demonstrate the use of tear fluid as a non-invasive source for dopamine measurements in humans. Methods: The study cohort included 30 clinically healthy individuals without any pre-existing ocular or systemic conditions. Matched tear fluid (using Schirmer's strips and capillary tubes) and plasma were collected from the subjects. Dopamine levels were evaluated using direct competitive chemiluminescent enzyme-linked immunosorbent assay (ELISA), dopamine kit (Cloud Clone Corp, TX, USA). 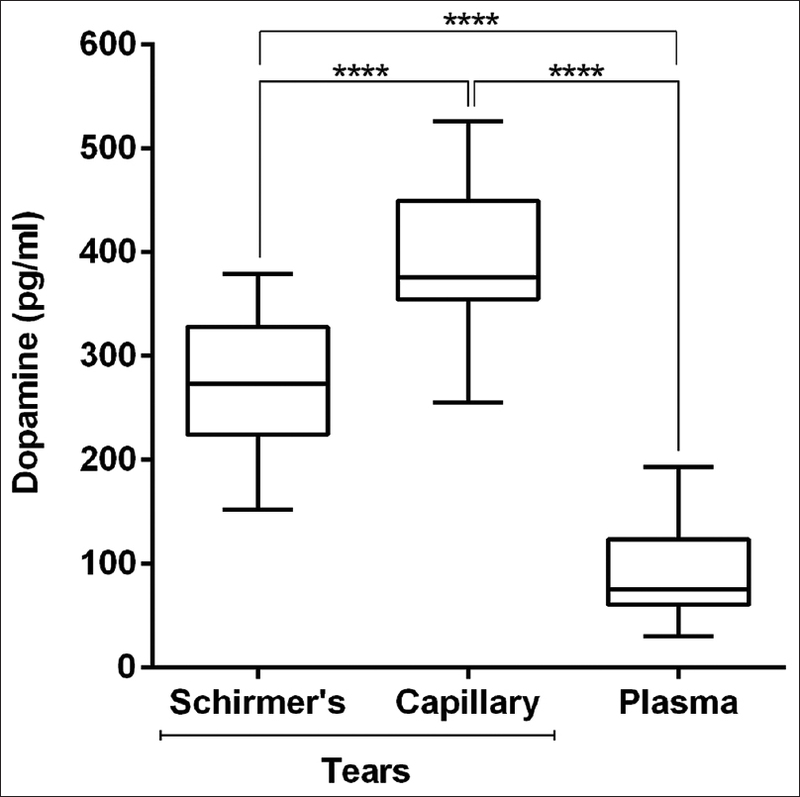 Results: Significantly higher dopamine levels were found in the tear fluid compared to plasma in the study subjects. The level of dopamine was 97.2 ± 11.80 pg/ml (mean ± SEM), 279 ± 14.8 pg/ml (mean ± SEM), and 470.4 ± 37.64 pg/ml (mean ± SEM) in the plasma and in the tears collected using Schirmer's strips and capillary tubes, respectively. Conclusion: Dopamine was detectable in all the tear fluid samples tested and was also found to be at a higher concentration than in plasma samples. Tear fluid can be used as a non-invasive sample source to monitor dopamine levels. Purpose: To study the demographic profile, clinical features, treatment outcome, and ocular morbidity of microbiologically proven Pythium keratitis in South India. 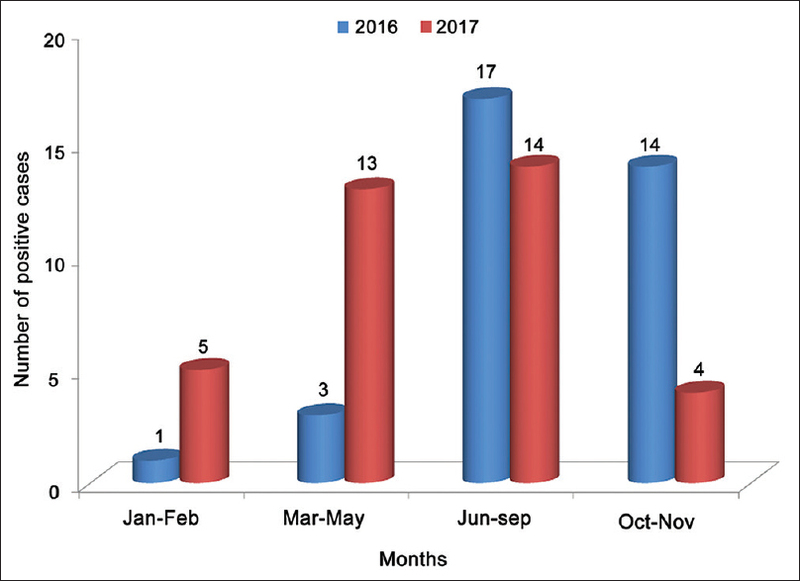 Methods: A retrospective analysis of clinical records of microbiologically proven Pythium keratitis at a tertiary eye care referral center in South India from January 2016 to November 2017 was performed. Demographic details, predisposing risk factors, microbiological investigations, clinical course, and visual outcome were analyzed. Results: Seventy-one patients with microbiologically proven Pythium keratitis were identified. The mean age was 44(±18.2) years with an increase in male preponderance and 50% were farmers. Duration of delay at time of presentation to the hospital was a mean of 14(±7.2) days. The visual acuity at baseline ranged from 6/6 to no light perception (median 2.1 logMAR). A combination of 5% natamycin and 1% voriconazole was given to 42% patients, and natamycin alone was given to 39.4% patients. 1% itraconazole eye drops alone was initiated in 7 (10%) patients and 3 among this group responded. 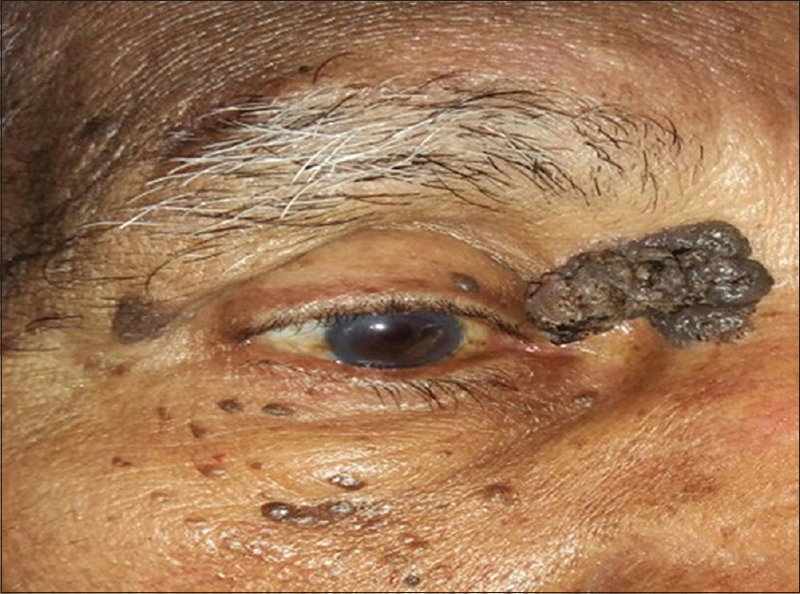 Therapeutic keratoplasty (TPK) was performed in 48 (67.6%) patients. None of the primary grafts remained clear after a period of 1 month. Twenty-six eyes (54.2%) had graft reinfection and all these eyes either developed anterior staphyloma (4) or were eviscerated (3) and 13 eyes became phthisical. The remaining 22 patients who had TPK resulted in failed graft. Among these, re-grafts were performed in 6 patients, of which 5 were doing well at the last follow-up. Conclusion: We report a large series of patients with Pythium keratitis. Promoting early and differential diagnosis, awareness of clinicians and specific treatment options are needed for this devastating corneal disease. Purpose: To report the distribution and trends of types of organisms and antibiotic susceptibility of the bacterial isolates obtained from patients with microbial keratitis. Methods: Microbiology records of culture-positive microbial keratitis that underwent a diagnostic corneal scraping and cultures were reviewed. Fungal, bacterial, and parasitic culture results and antibiotic susceptibility profile of bacteria were analyzed and comparisons were made between two halves of the study period (2007–2010 vs. 2011–2014). Results: A total of 3981 corneal scrapings were processed during the 8-year study period. Pathogen was recovered in culture in 1914 (48.1%) samples. Fungi, bacteria, and parasites constituted 38.7%, 60%, and 1.3% of the total isolates, respectively. The common fungal isolates were Aspergillus spp. (224/868, 25.8%) and Fusarium spp. (200/868, 23.0%), while common Gram-positive bacteria were Streptococcus pneumoniae (217/1125, 19.3%) and Staphylococcus aureus (185/1125, 16.4%), and common Gram-negative bacteria was Pseudomonas spp. (99/219, 45.2%). There was no significant difference in proportion of bacterial (P = 0.225) and fungal (P = 0.421) keratitis between the first half and second half of the study period. There was a significant increase in proportion of Gram-positive isolates (P = 0.015) [353/758 (46.6%) vs. 772/1482 (52.1%)] and decrease in proportion of Gram-negative organisms (P = 0.044) [88/758 (11.6%) vs. 131/1482 (8.8%)] in the recent years. In-vitro antibiotic susceptibility testing showed decrease in susceptibility to moxifloxacin for Pseudomonas spp. (P = 0.016) in recent years. Conclusion: Prevalence of fungal and bacterial keratitis has remained unchanged over the years. This study shows a significant increase in Gram-positive bacterial infection and decrease in Gram-negative bacterial infection of the cornea in the recent years. Purpose: The aim of this study was to present an experimental optical coherence tomography (OCT)–guided anterior segment (AS) imaging chick embryo model. Through this model, we aimed to reveal similarities and differences between human cornea, AS tissues, and chick embryo tissues by quantitative image analysis. Methods: Ex vivo, the chick embryos' globes were determined by detailed AS camera of spectral-domain (SD)-OCT in 10 fertilized specific pathogen-free eggs on the 20th day. 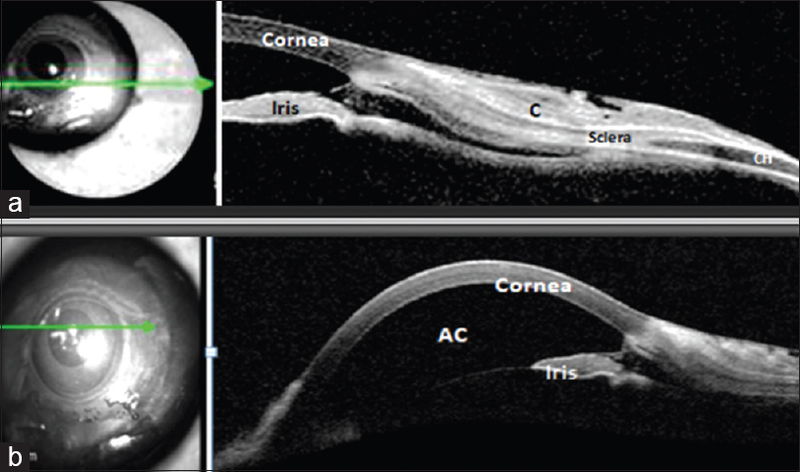 Quantitative image analysis of anterior chamber tissues was performed with SD-OCT in detail. After imaging, cross sections of the chick embryo globes containing cornea with anterior chamber were histologically examined and compared with human tissues. The similarities of our model with data in the human cornea and AS studies in the literature were compared. Results: SD-OCT imaging was able to successfully delineate the AS tissues of chick embryos such as the cornea, iris, lens, pupil, conjunctiva, ciliary body, anterior chamber, and lens. Quantitative semi-automated measurements showed the following: mean central corneal thickness: 213.4 ± 7.05 μm (197–223 μm), mean anterior chamber depth: 878.9 ± 41.74 (804–919 μm), mean anterior chamber area: 2.43 ± 0.16 mm2 (2.17–2.73 mm2), mean corneoscleral junction (limbal) thickness: 322.8 ± 20.05 μm (289–360 μm), and mean iris thickness: 230.4 ± 13.27 μm (203–245 μm). In addition, detailed histological comparisons of the AS tissues with human tissues were evaluated to be very similar. Conclusion: In conclusion, this chick embryo model mimics human tissues and it can be considered as a platform for the study of teratogen-induced malformations and AS dysgenesis during gestation of AS tissues. In addition, this study demonstrates the feasibility of SD-OCT in the quantitative assessment of AS structures in chick embryo model. Purpose: To compare the visual outcomes and complications between the eyes receiving retropupillary iris claw intraocular lens (IOL) and scleral-fixated IOL (SFIOL) for post-cataract aphakia. Methods: Medical records of consecutive patients who had iris claw IOL and SFIOL surgery from January 2010 to March 2015, with > 1 year of follow up were retrospectively analyzed. The surgical technique was based on individual surgeon preference. The best-corrected distance visual acuity (BCDVA), previous surgery, surgical technique, and complications were analyzed. Results: Retropupillary iris claw IOL was fixated in 48 eyes (46%) and SFIOL was performed in 56 eyes. Iris claw was performed more frequently at the time of primary cataract surgery (56%) compared to SFIOL (14%) (P < 0.001). 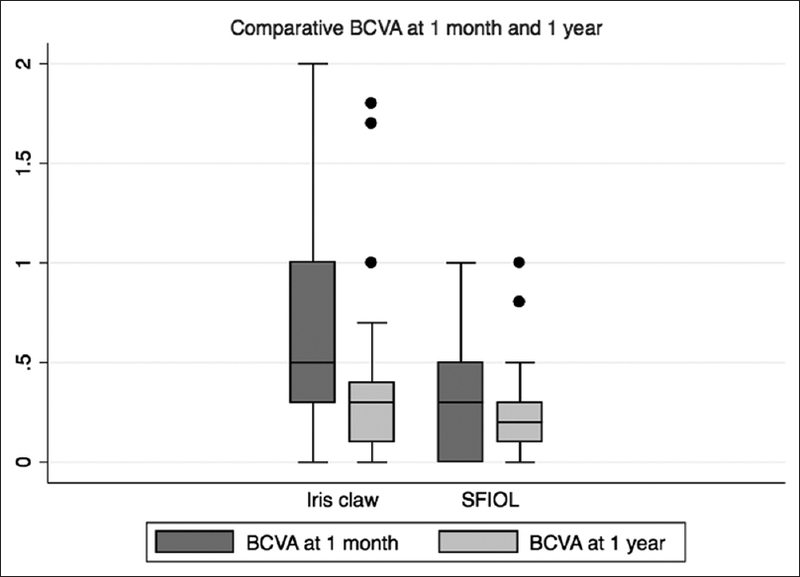 At 1 month postoperative, BCDVA was significantly better in the SFIOL group [0.7 ± 0.5 logarithm of minimum angle of resolution (logMAR) in iris claw vs. 0.3 ± 0.2 logMAR in SFIOL, P < 0.001] but this difference did not persist at 1 year (0.4 ± 0.4 logMAR in iris claw vs. 0.3 ± 0.2 logMAR in SFIOL, P = 0.56). Eyes with iris claw IOL experienced significantly more postoperative iritis (17%), intraocular pressure spikes (10%), and ovalization of the pupil (16%). Conclusion: Retropupillary iris claw IOL fixation is as safe as SFIOL for visual rehabilitation of post-cataract aphakia. Visual rehabilitation following iris claw IOL might take longer than SFIOL. Ovalization of the pupil is the commonest adverse effect reported with this type of IOL design. 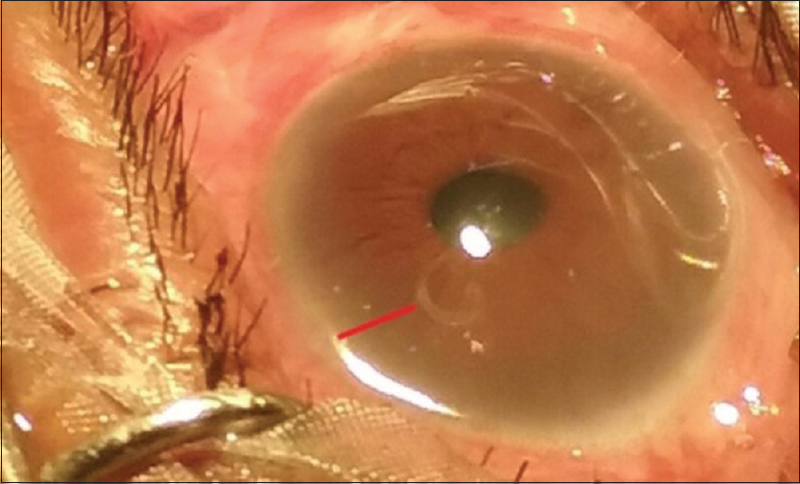 Purpose: To report results of a novel technique for sutureless, glueless intrascleral fixation of three-piece posterior chamber intraocular lens (IOL) using 26-G needle for management of aphakia. Methods: In this prospective series, 30 eyes of 20 patients with aphakia, subluxated IOL, or crystalline lens were included. 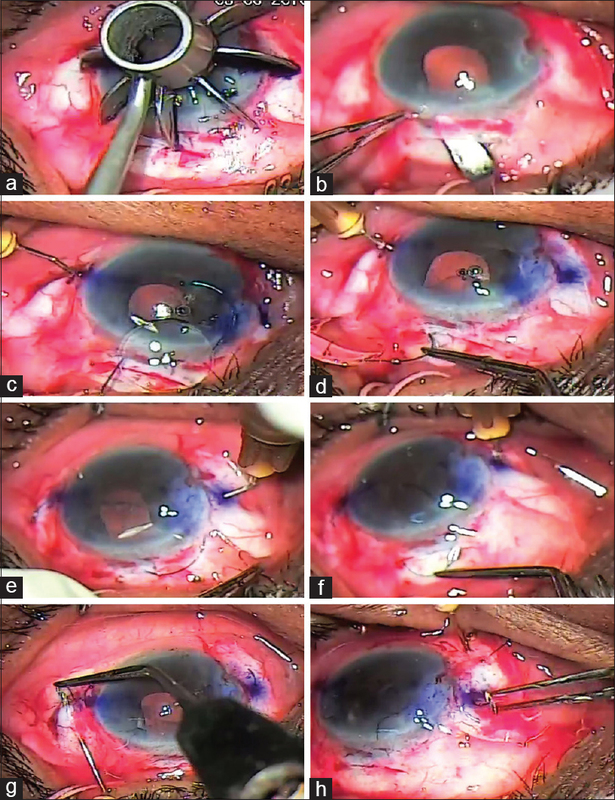 26-G-needle-guided intrascleral fixation of three-piece posterior chamber IOL was performed according to the described technique. The patients were evaluated on day 2, 1 week, 6 weeks, and 3 months postoperatively for change in best-corrected visual acuity (BCVA), intraocular pressure (IOP), IOL centration, and any other complications. The postoperative tilt of the IOL was indirectly measured by determining the lenticular astigmatism which in turn was calculated by the difference between net corneal astigmatism and refractive astigmatism. Paired t-test was used to determine the significance of any association between the preoperative and postoperative BCVA and IOP. P < 0.05 was considered significant. Results: Of 30 eyes (n = 30 patients), 18 were surgical aphakia, 6 traumatic aphakia, 5 subluxated IOL, and 1 ectopia lentis (Marfan syndrome). The mean preoperative BCVA was 1.37 ± 0.37 (logMAR) and postoperative BCVA at 3 months was 0.37 ± 0.29 (logMAR). A significant improvement in the mean BCVA (P < 0.05) was observed after the procedure. The mean IOP preoperatively was 13.33 ± 4.18 and postoperatively at 3 months was 12.82 ± 3.97 (P > 0.05), which was not significant. None of the eyes developed any intraoperative and postoperative complications. The IOLs had appropriate centration and stability. Conclusion: We have developed this new technique for intrascleral IOL fixation which is quite simple, cost-effective, minimally invasive, neither requires glue nor suture and gives consistent outcome. Purpose: To assess the safety and efficacy of intraoperative intravitreal dexamethasone implant in patients of juvenile idiopathic arthritis (JIA)-associated uveitis undergoing phacoemulsification with posterior chamber intraocular lens (PCIOL) implantation. Methods: Retrospectively, data of patients with JIA-associated uveitis undergoing phacoemulsification with PCIOL implantation with intraoperative dexamethasone implant injection were analyzed. Patients with a minimum follow-up of 6 months were included. Primary outcome measures were ocular inflammation, intraocular pressure (IOP), best-corrected visual acuity (BCVA), and worsening of uveitis. Results: 8 eyes of 6 patients were included. BCVA was significantly improved at 1, 3, and 6 months postoperatively 0.20 ± 0.09, P = 0.008; 0.18 ± 0.11, P = 0.008; and 0.24 ± 0.11, P = 0.01, respectively. No statistical difference noted in mean IOP at various follow-up visits. None developed worsening of uveitis or Cystoid macular edema. Conclusion: Intraoperative intravitreal dexamethasone implant is a safe and effective in preventing and managing the postoperative inflammation in children with JIA-associated uveitic cataract. Purpose: To determine the diagnostic accuracy of a linear discriminant function (LDF) based on macular ganglion cell complex (GCC), optic nerve head (ONH) and retinal nerve fibre layer (RNFL) for differentiating early primary open-angle glaucoma (POAG) from glaucoma suspects. Methods: In this cross-sectional study, data from consecutive 127 glaucoma suspects and 74 early POAG eyes were analysed. Each patient underwent detailed ocular examination, standard automated perimetry, GCC and ONH and RNFL analysis. After adjusting for age, gender and signal strength using the analysis of covariance; Benjamin–Hochberg multiple testing correction was performed to detect truly significant parameters to calculate the LDF. 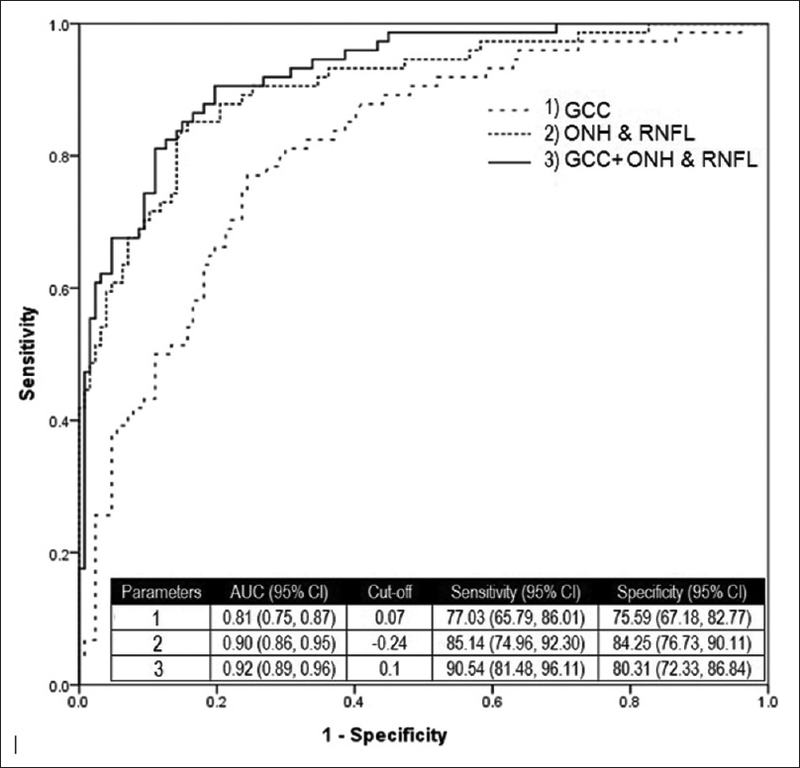 Subsequently, diagnostic accuracy of GCC and ONH and RNFL were determined. The obtained LDF score was evaluated for diagnostic accuracy in another test set of 32 suspect and 19 glaucomatous eyes. Data were analysed with the R-3.2.1 (R Core Team 2015), analysis of variance, t-test, Chi-square test and receiver operating curve. Results: Among all GCC parameters, infero temporal had the best discriminating power and average RNFL thickness and vertical CDR among ONH and RNFL parameters. LDF scores for GCC had AUROC of 0.809 for a cut-off value 0.07, while scores for ONH and RNFL had AUROC of 0.903 for a cut-off value − 0.24. Analysis on combined parametric space resulted in avg RNFL thickness, vertical CDR, min GCC + IPL and superior GCC + IPL as key parameters. LDF scores obtained had AUROC of 0.924 for a cut-off value 0.1. The LDF was applied to a test set with an accuracy of 84.31%. Conclusion: The LDF had a better accuracy than individual GCC and ONH and RNFL parameters and can be used for diagnosis of glaucoma. 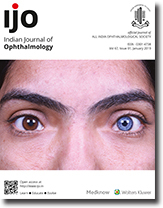 Purpose: To compare a general vision-specific patient-reported outcomes (PRO) instrument, National Eye Institute Visual Function Questionnaire-25 (NEIVFQ-25) with two disease-specific PRO instruments, Glaucoma Quality of Life-15 (GQL-15), and Viswanathan 10 in patients with varying severity of primary open angle glaucoma (POAG). Methods: This hospital-based, prospective study enrolled 140 glaucoma patients. The patients were classified into mild, moderate, and severe glaucoma based on visual field defects. All these patients were administered the three PRO instruments and the results were statistically analyzed. Results: All the three instruments showed high internal consistency (Cronbach's alpha for GQL-15, NEIVFQ-25, and Viswanathan 10 were 0.918, 0.937, and 0.929, respectively) There was a statistically significant difference between patients with mild, moderate, and severe POAG with all instruments (P ≤ 0.001). The instruments correlated well across several parameters especially the peripheral vision and glare/dark adaptation. The disease-specific scales however are simpler and faster to administer. Conclusion: All three instruments were reliable in assessment of mild, moderate, and severe glaucoma. They correlated strongly with each other in most of the related subscales, domains, and questions. 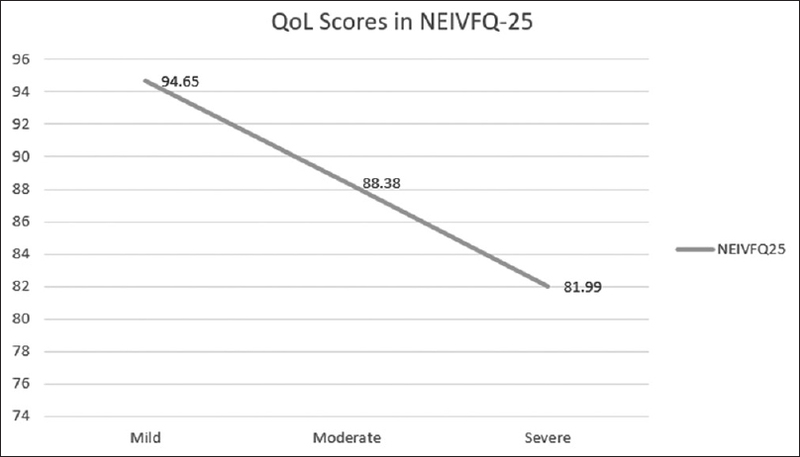 NEIVFQ-25 additionally gave information regarding the general, psychological, and social effects of the disease. Purpose: To evaluate the effect of acute submaximal exercise on intraocular pressure (IOP) fluctuations in open-angle glaucoma (OAG) subjects using an ocular telemetry sensor (OTS, Sensimed TriggerFish®). Methods: Twelve OAG subjects aged 45–65 years with no medical limitation for exercise were included in this prospective study. 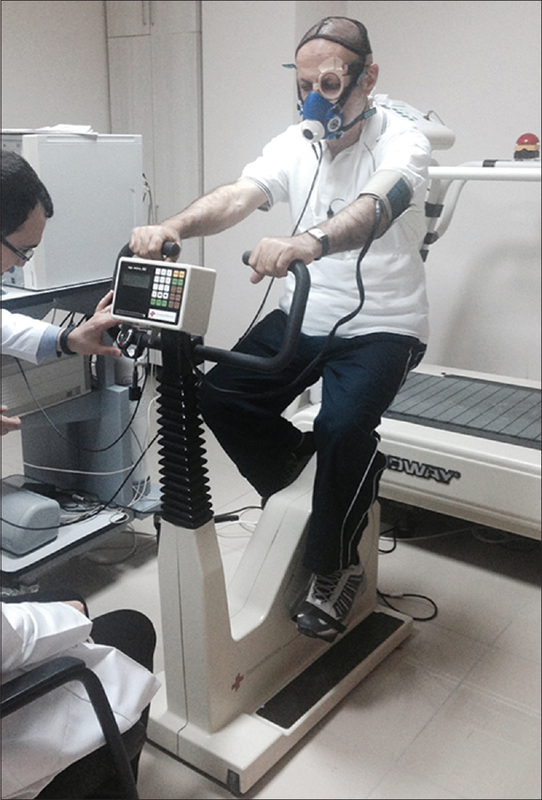 A submaximal exercise test was performed using a cycle ergometer for 20 min during which OTS voltages and metabolic parameters were recorded continuously. 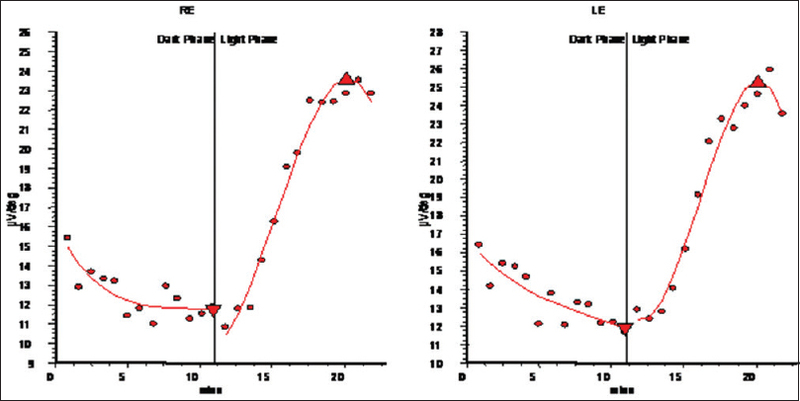 IOP voltages taken before, during, and after exercise were compared using the Friedman test and correlations with the metabolic parameters were evaluated using the Spearman analysis. Results: In two subjects, the OTS stopped functioning after a few hours. Median OTS measurements were 37.60 mVeq 10 min before exercise [interquartile range (IQR) 137.27], 51.75 (IQR 121.2), 62.35 (IQR 123.72), 54.6 (IQR 141.3), and 59.7 mVeq (IQR 196.7) during exercise (4 time points, 5 min apart), and 50.7 (IQR 147.35) and 64.2 mVeq (IQR 103.25) 10 and 30 min after exercise and the change was statistically non-significant (P = 0.66). No correlations were found between OTS and metabolic parameters measured at the same time points (P > 0.05). Nocturnal acrophase pattern was detected in five subjects (50%), diurnal acrophase in two patients, and double-hump in two patients. Median IOP voltages in the morning, afternoon/evening, and night were 335.84, 149.15, and 341.38 mVeq, respectively (P < 0.001). Conclusion: Continuous IOP monitoring did not reveal a remarkable voltage change in OAG patients during or immediately after exercise, but nocturnal IOP peaks in half of the patients. Purpose: To evaluate the surgical outcomes of repeat trabeculectomy augmented with risk factor adjusted mitomycin C (MMC) exposure in eyes with previous failed trabeculectomy. Methods: Case records of 38 eyes of 37 patients with previous failed filter who underwent repeat trabeculectomy with MMC were reviewed retrospectively. Main outcome measures were best-corrected visual acuity (BCVA), intraocular pressure (IOP) reduction, requirement of anti-glaucoma medications, postoperative complications, and surgical success (defined as IOP of ≤21 mmHg and >5 mmHg along with 20% reduction from preoperative IOP with or without adjuvant medications) at 1-year postoperatively. Statistical analysis was done using the STATA 14.1 (Texas, USA). Results: Patient's mean age was 46.41 (±20.43) years and the mean preoperative IOP was 32.73 (±9.26) mmHg which reduced to 16.22 (±7.08) mmHg postoperatively at 12 months (P < 0.001). 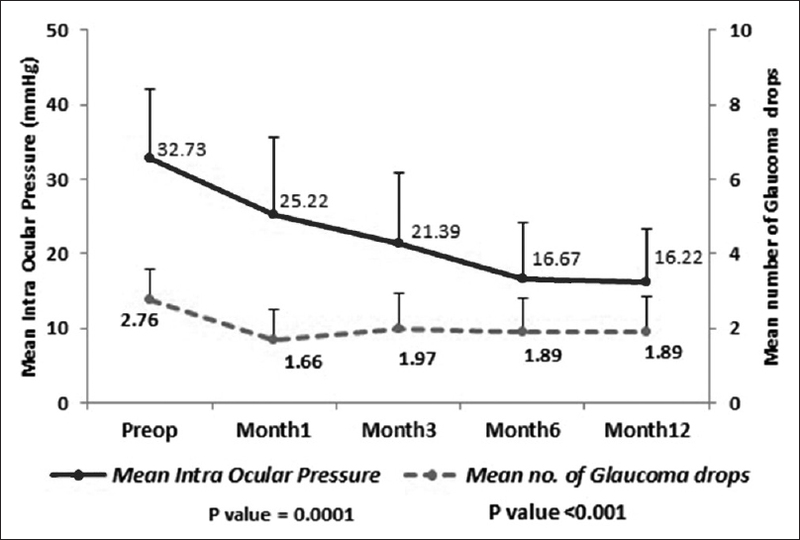 Mean number of anti-glaucoma medications reduced from 2.76 (±0.83) preoperatively to 1.89 (±0.95) postoperatively (P < 0.001). Surgical success was observed in 81.1% at 1 year (n = 30). Eyes that received MMC >3 min had a postoperative mean IOP of 12.50 (±3.23) mmHg compared to 23.08 (±7.19) mmHg with MMC <3 min (P < 0.001). Seven eyes (18.4%) developed postoperative complications, and all were seen in eyes that received MMC >3 min (P = 0.033). Conclusion: Repeat trabeculectomy with MMC, used in higher concentration and exposure time altered according to individual risk factor plays a crucial role in the success and hence it could be considered as a viable option before planning a tube surgery. Purpose: To elucidate the clinical profile of visual impairment (VI) and rehabilitation of the uveitic patients with irreversible low vision. Methods: Retrospective analysis of visual rehabilitation of patients with uveitis suffering from poor vision with low vision devices (LVD). Results: Most common cause of uveitis was choroiditis (46.29%), followed by retinitis (25.92%), retinochoroiditis (18.51%), and chronic panuveitis sequelae (9.25%). Of these 54 cases, 35.18% had moderate VI, 25.92% had severe VI, 20.37% had mild VI, and 18.51% had profound VI or blindness. Statistically significant improvement (P < 0.05) in near vision was seen in choroiditis (52%) and retinitis (72%), whereas clinically significant improvement in distance vision was found in patients with choroiditis. Most commonly prescribed LVD was half-eye prismatic spectacle magnifier (22.2%). Conclusion: Rehabilitation of the uveitic patients with low vision is challenging. LVD may be a beneficial tool in these patients to help them perform their day-to-day activities independently. 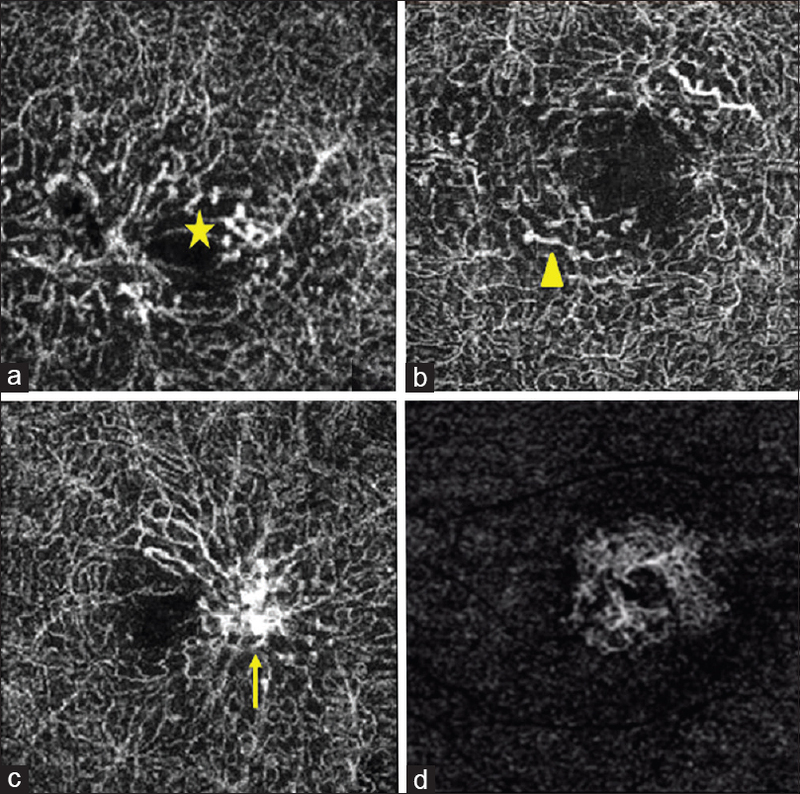 Purpose: To identify optical coherence tomography-angiography (OCT-A) findings to predict treatment response during anti-vascular endothelial growth factor (VEGF) therapy in eyes with para foveal telangiectasia (PFT) group II. 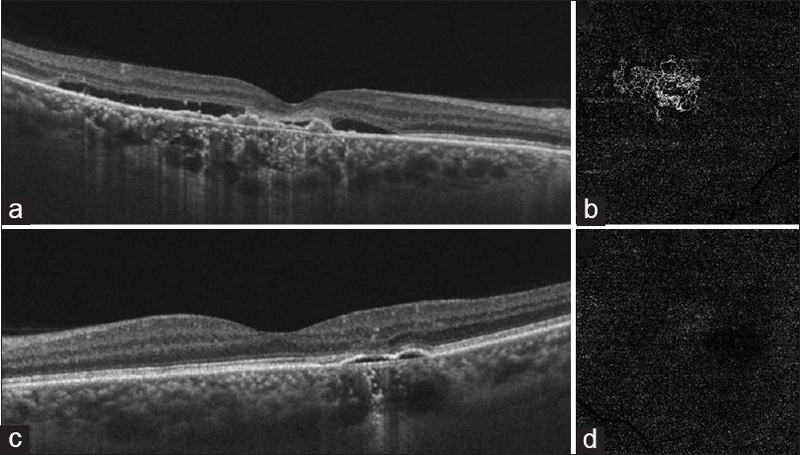 Methods: In this retrospective series, Twelve eyes of seven patients diagnosed with PFT group II without evidence of sub-retinal neovascular membrane (SRNVM) clinically or on spectral domain-OCT (SD-OCT) were included. All patients underwent OCT-A on the Topcon DRI OCT Triton® with 4.5 mm macula scans. 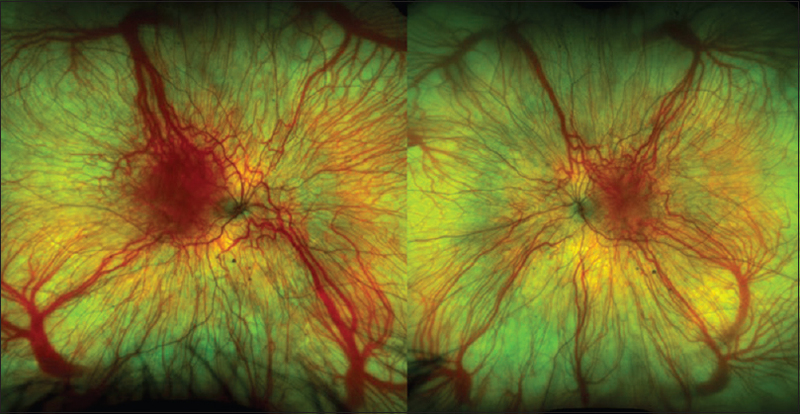 The patients with abnormal vascular nets were further classified into type A and B nets and administered intravitreal anti-VEGF therapy. 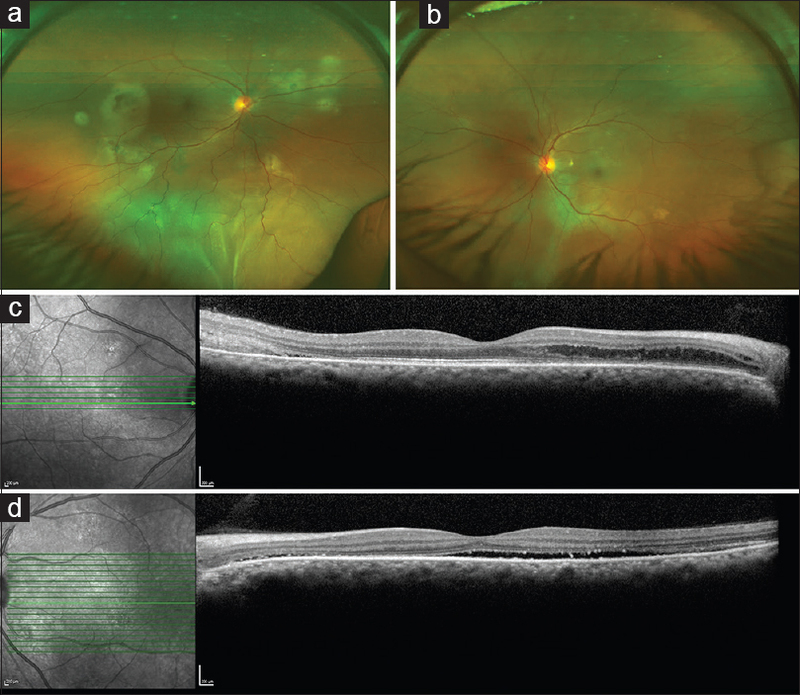 Visual acuity and size of type A and B nets were evaluated pre- and post-injection. Paired t- test and intraclass correlation were used to analyse data. Results: Patients with type A net showed significant improvement in visual acuity (logMAR 0.38, P = 0.0047). The size of type A net showed statistically significant decrease (P = 0.0008) on 6 month follow up. Type B net did not show statistically significant difference in visual acuity or size following anti-VEGF therapy. Conclusion: OCT-A plays an important role in early detection of possible neovascular nets (type A), in the absence of obvious SRNVM. Treatment decisions based on OCT-A may be helpful to achieve better visual outcome. Purpose: To test the hypothesis that eye muscle surgery in treatment of patients with acquired downbeat nystagmus results in improvement measures of visual and ocular motor function. Methods: This is a prospective, interventional case series analysis of clinical and electrophyisological data before and after eye muscle surgery in 17 patients with acquired downbeat nystagmus who did not respond to medical treatments. Outcome measures included: 1) routine demography and clinical characteristics, 2) subjective oscillopsia (SO), 3) binocular best-corrected visual acuity in the null position (BVA), 3) primary position strabismic deviation (SD), 5) anomalous head posture (AHP), 6) contrast sensitivity function (CS), and 7) nystagmus slow phase velocity (SPV). All patients were followed at least 12 months. Parametric and non-parametric statistical analysis of outcome measure data above pre- and post-treatment were perfomed using standard software on grouped data using computerized software. Results: Patients' age ranged from 5 to 85 years (average 27 years). About 59% were male. Follow up ranged from 1–10 years (average 2.0 years). Around 70% had an associated central nervous systemic diagnosis, 100% had an AHP, oscillopsia and decreased CS, 53% had other eye disease, and 59% had strabismus. There were no complications from surgery. There were signficant post-treatment improvements in mean/median group BVA, SO, SD, AHP, CS, and SPV. Conclusion: This study supports the hypothesis that eye muscle surgery as treatments for patients with acquired downbeat nystagmus can result in improvements in multiple aspects of ocular motor and visual functions. Ligneous conjunctivitis (LC) is a rare form of pseudomembranous conjunctivitis seen in children, perhaps due to plasminogen deficiency, which manifest as a chronic refractory pseudomembranous conjunctivitis. LC cases are incapable in maintaining their fibrinolytic activity due to plasminogen deficiency; consequently, transudates of plasma assume as a thick, gelatinous, woody membranes over the mucosal surfaces. This is a short case report on a child with a LC, who presented with recurrent pseudomembranous conjunctivitis in conjunction with progressive congenital hydrocephalus due to aqueductal stenosis (Dandy–Walker syndrome). This rare association was clinically confirmed and prompt corrective surgical measures were instituted. 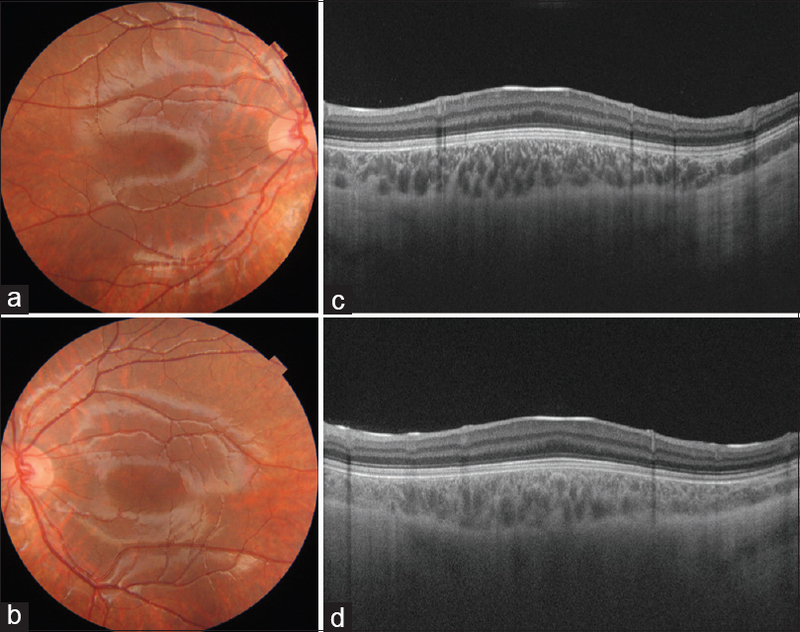 In this report, we report the case of a 7-year-old boy with corneal neovascularization due to exposure keratopathy following cerebellar astrocytoma surgery. 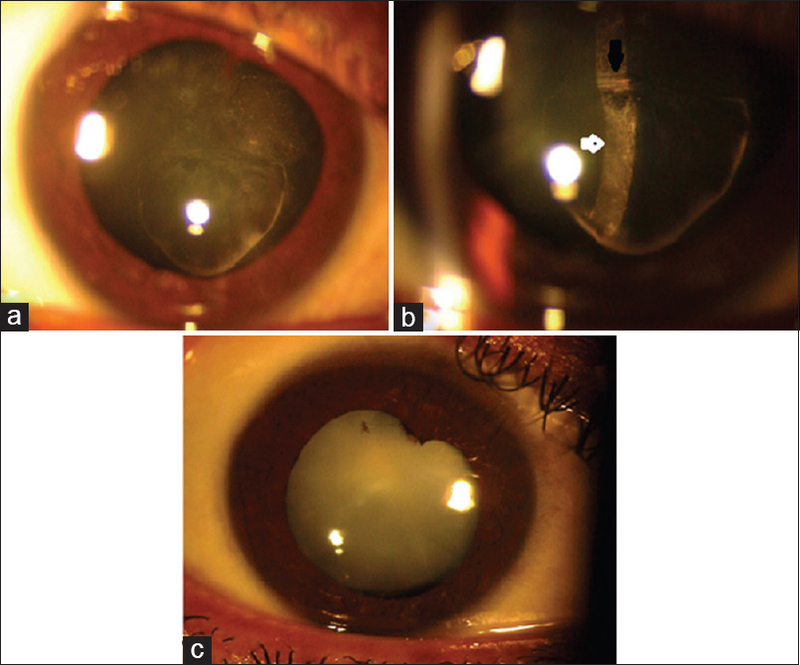 Corneal surface healing was achieved with topical treatment and therapeutic contact lens, after which topical steroid was administered for stromal haze and corneal neovascularization. After 2 months of steroid therapy failed, corneal neovascularization responded well to topical aflibercept administration, showing complete regression. 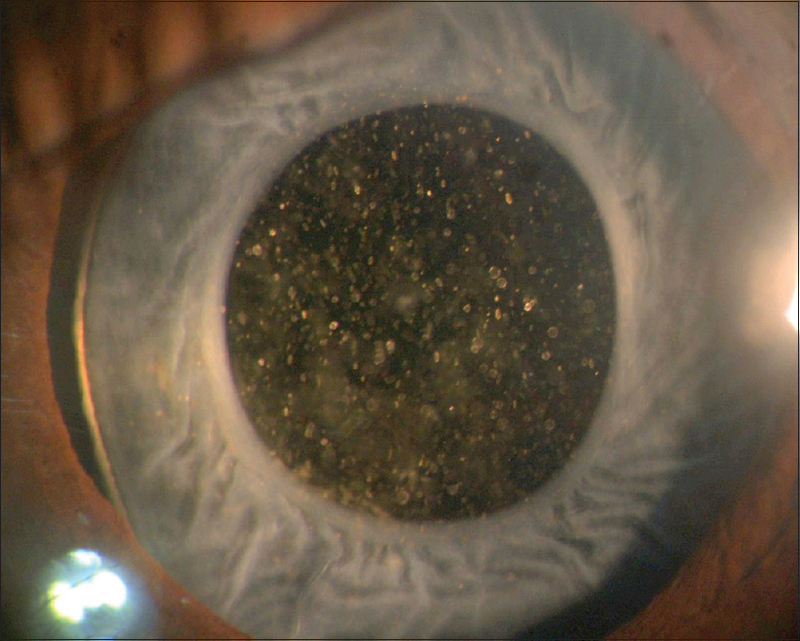 A 75-year-old male with a right eye history of chronic dry eye syndrome, glaucoma status post tube shunt, and Fuchs dystrophy status post Descemet stripping endothelial keratoplasty followed by penetrating keratoplasty (PKP) presented with a 2.7 × 4.2 mm corneal ulcer, culture positive for Shewanella algae and Klebsiella oxytoca. A topical antibiotic regimen of gentamicin 14 mg/mL and vancomycin 50 mg/mL was administered according to culture sensitivities. There was concurrent use of loteprednol 0.5% (Lotemax Gel, Bausch and Lomb, Rochester, NY, USA) and later addition of erythromycin 0.5% ointment. The corneal ulcer improved with antibiotic therapy but was complicated by poor patient follow-up. 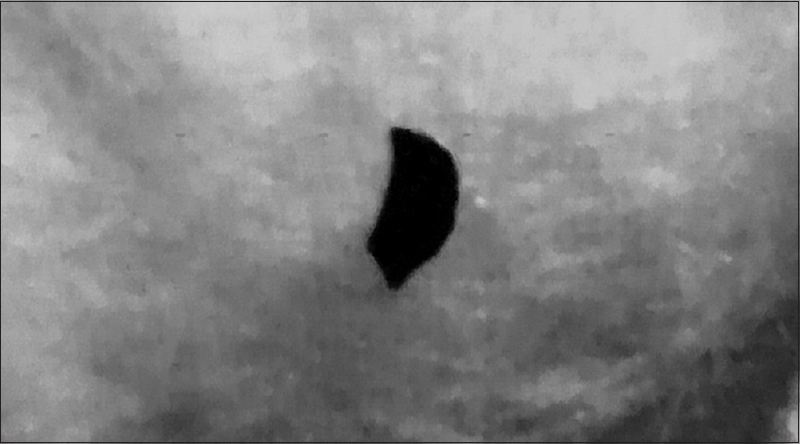 Descemetocele formation prompted PKP in the right eye. The graft was successful and visual acuity improved from a low of light perception to maximum of 20/200 Snellen. 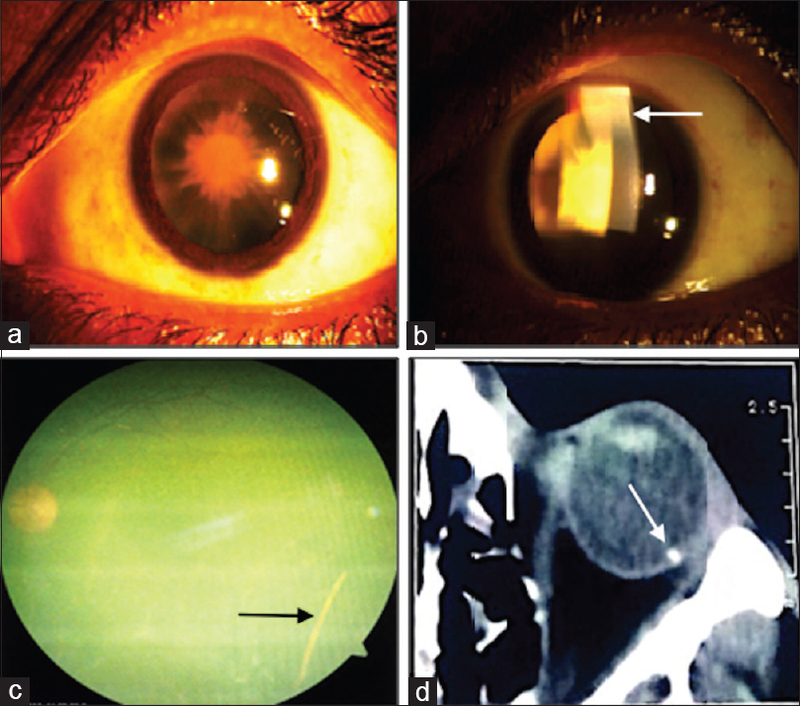 A 55-year-old lady developed a corneal ring infiltrate following trauma with a wooden stick. 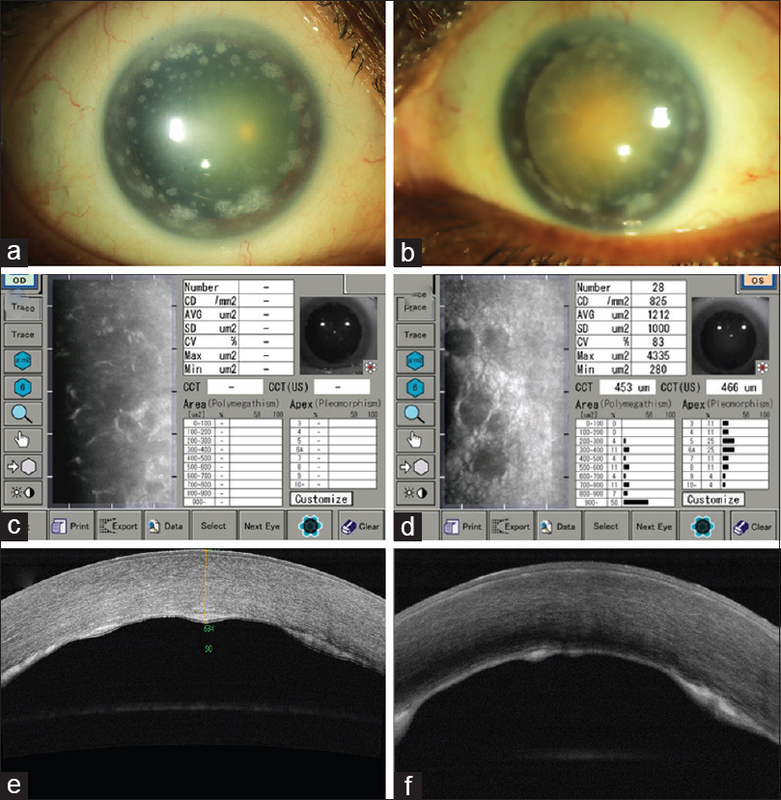 10% KOH mount of corneal scrapings revealed septate hyaline fungal filaments. White feathery colonies with shiny black dots grew on potato dextrose agar. Characteristic features of Pestalotiopsis spores were seen on Lactophenol cotton blue mount. DNA sequencing showed 99% similarity with Pseudopestalotiopsis theae. Complete resolution was noted with topical and oral antifungals. To the best of our knowledge, this is the first report of Pseudopestalotiopsis keratitis following trauma with vegetative matter highlighting the role of DNA sequencing in identification of rare fungi. 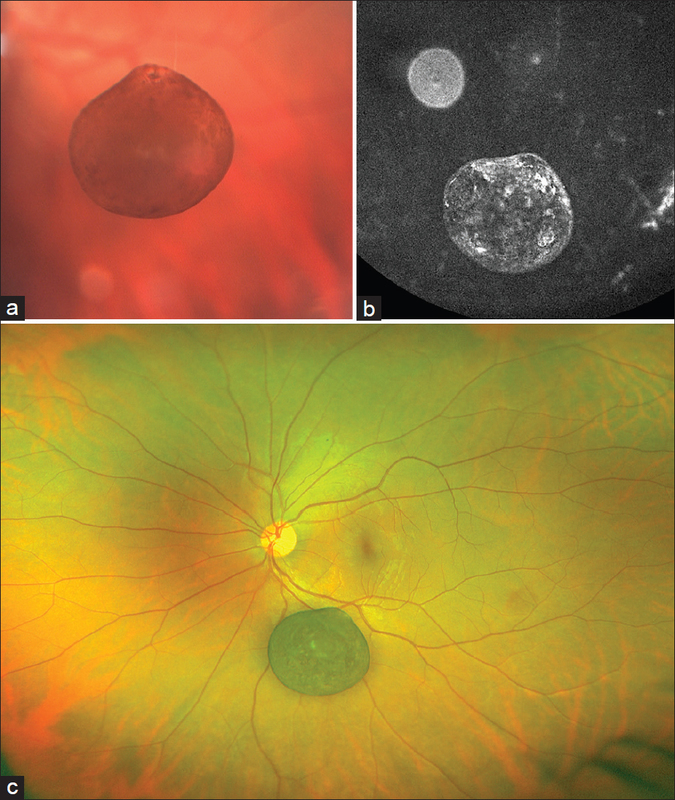 A 36-year-old female presented initially with photophobia and visual deterioration. After examination and laboratory tests, patient was diagnosed with cystinosis. Cysteamine drops 4 × 1 drops/day was given as treatment for 1 year. During follow-up, in vivo confocal microscopy (IVCM) and anterior segment optical coherence tomography (AS-OCT) was performed. Photophobia was relieved and IVCM obtained the decrease in size and density of corneal crystals 1 year after. 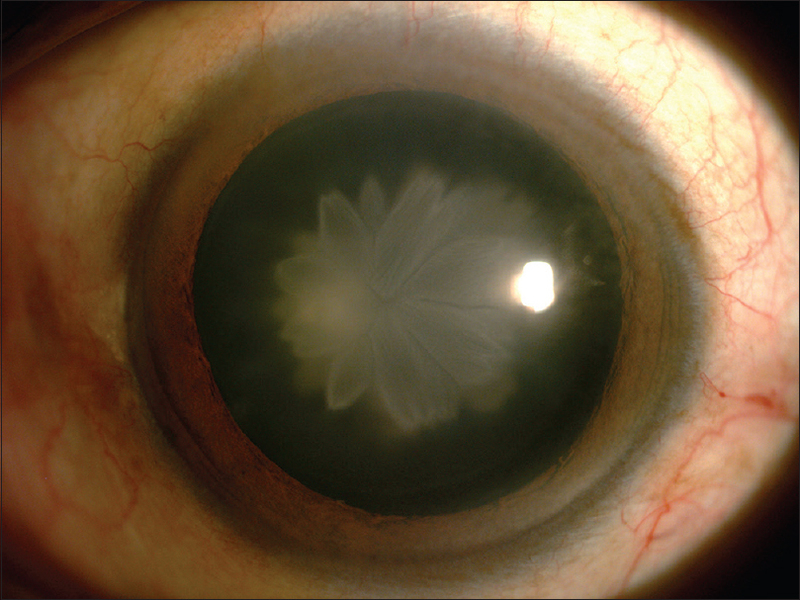 Depth of corneal crystals did not change but crystal density score reduced with cysteamine treatment. 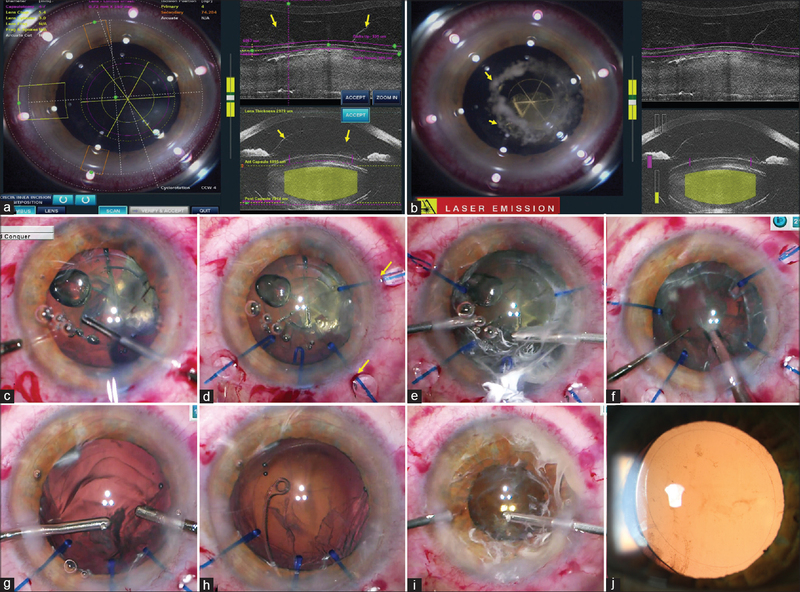 Femtosecond laser-assisted cataract surgery was performed in a case of posttraumatic cataract with six clock hours subluxation and vitreous in the anterior chamber (AC). 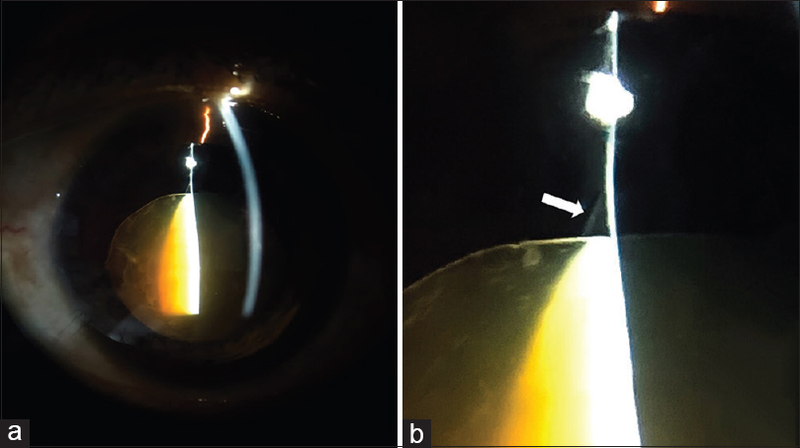 Femtosecond laser pretreatment allowed a closed-chamber creation of corneal incisions, capsulotomy, and lens fragmentation with minimal sudden lens-diaphragm movements and zonular stress. Integrated imaging systems allowed customization of the size and position of capsulotomy and nuclear fragmentation, based on the extent and site of subluxation. 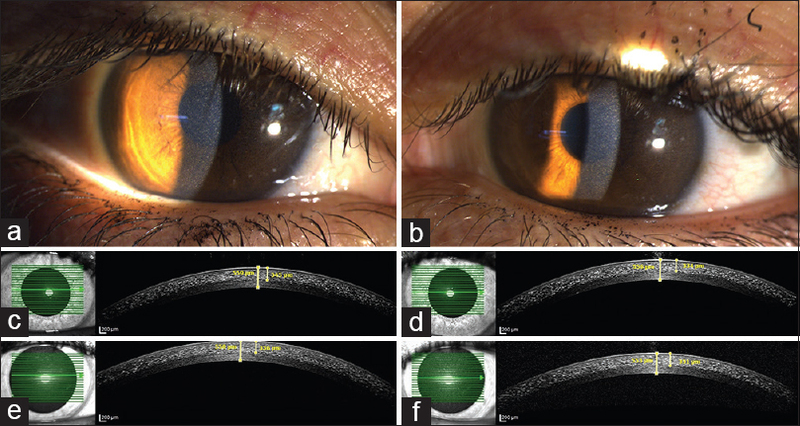 Presence of vitreous in AC did not hamper femtosecond laser application. 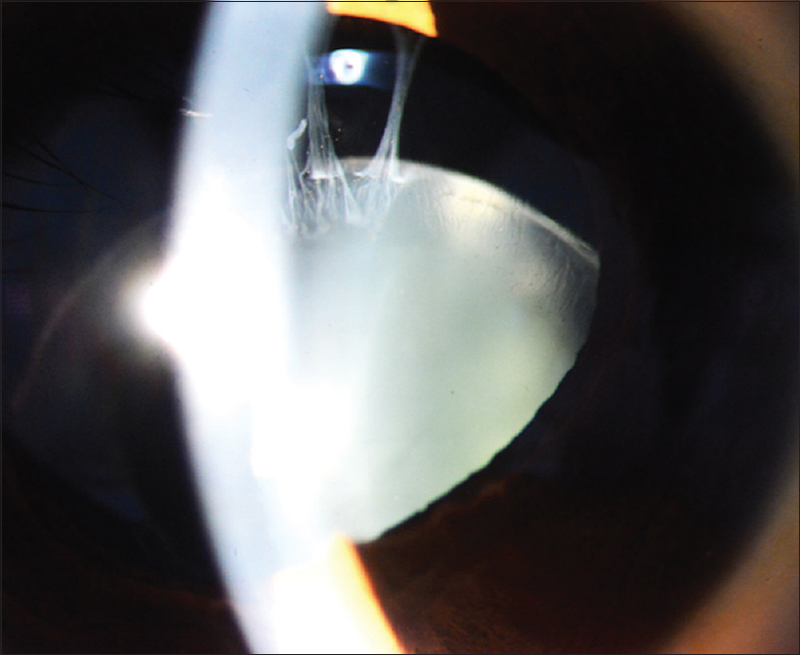 Triamcinolone-assisted vitrectomy was performed before phacoemulsification and after implanting the intraocular lens (IOL). Postoperative uncorrected visual acuity was 20/20 with a stable IOL. Live worm in anterior chamber is a rare finding. We hereby report a case of ocular Angiostrongylus cantonensis, which, to the best of our knowledge, is the third case report from India. A 70-year-old female presented with the complaints of watering and foreign body sensations in right eye since 2 months. On examination, a translucent worm of approximately 15 mm length was found freely moving in anterior chamber. Patient underwent surgical removal of live worm, which was identified as A. cantonensis. Educating people regarding importance of hygiene is important for prevention of worm infestation. Ophthalmic manifestations of multiple sclerosis are frequent including acute optic neuritis, ocular motor disturbances and intermediate uveitis. 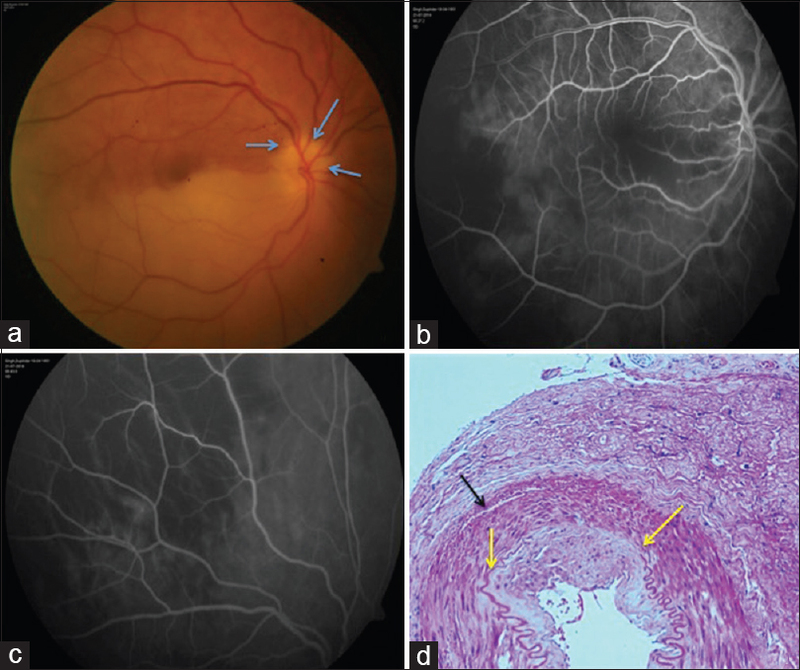 We report an unusual case of multiple sclerosis presenting as acute hypertensive uveitis. 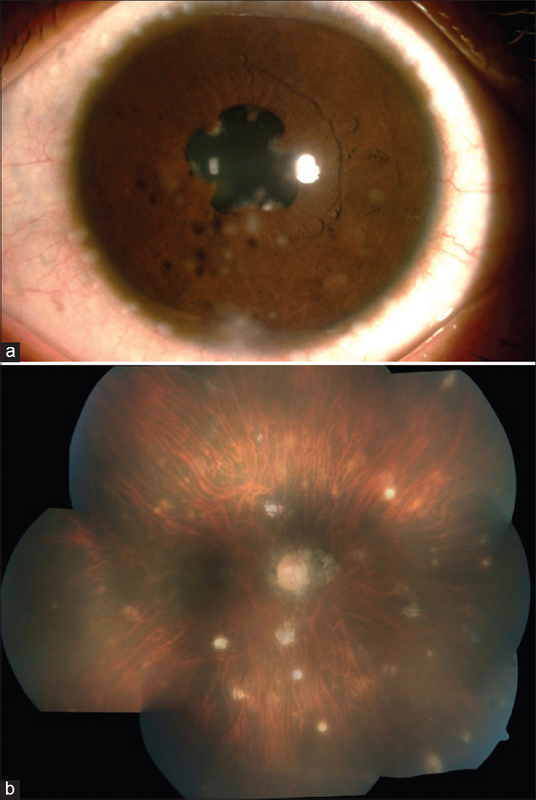 A 56-year-old man was referred by his family doctor with a 2-week history of right eye pain and decreased vision. Best-corrected visual acuity was Count Fingers on the right and 6/9-2 on the left. Intraocular pressure was 55mmHg and 14 mmHg on the right and left respectively. He had a right relative pupillary defect and a left internuclear ophthalmoplegia. Vitreous cells were present in the right eye and there was peripheral sclerosis and periphlebitis superior temporally. MRI Brain and Spine revealed multiple T2 hyperintense lesions consistent with multiple sclerosis. Multiple sclerosis may present initially with an acute elevation of intraocular pressure and intermediate uveitis. Blau syndrome (BS) is a rare autoinflammatory disorder characterized by the clinical triad of arthritis, uveitis, and dermatitis due to heterozygous gain-of-function mutations in the NOD2 gene. BS can mimic juvenile idiopathic arthritis (JIA)-associated uveitis, rheumatoid arthritis, and ocular tuberculosis. We report a family comprising a mother and her two children, all presenting with uveitis and arthritis. A NOD2 mutation was confirmed in all the three patients – the first such molecularly proven case report of familial BS from India. 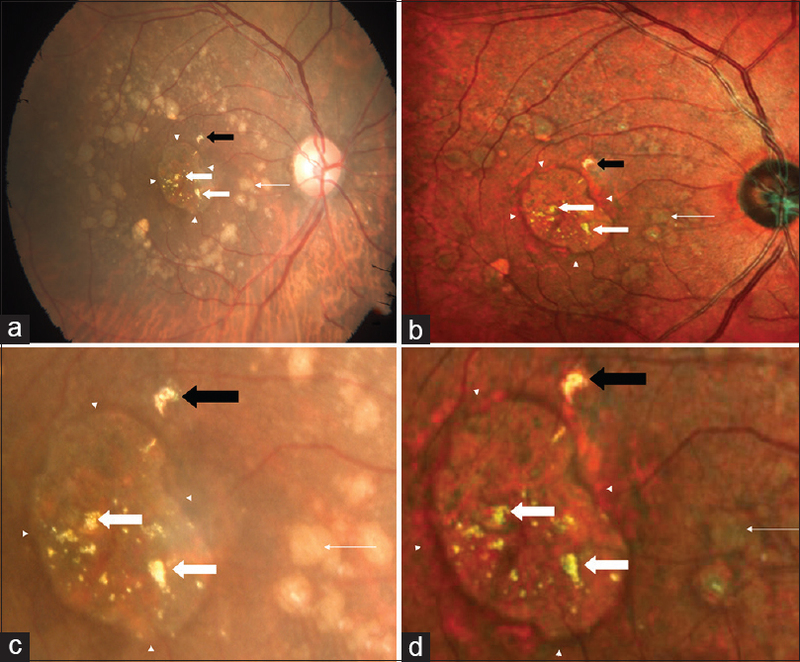 In this report, we describe a rare case of a 44-year-old Asian male with acute central serous chorioretinopathy (CSC) with bullous exudative retinal detachment. Endocrinology evaluation revealed hypothalamic–pituitary–adrenal axis suppression with low serum cortisol. Furthermore, neuroimaging revealed the presence of a pituitary microadenoma. He was treated with systemic eplerenone and hydrocortisone. After 12 weeks, bullous detachment completely resolved. Our case is a unique description of acute CSC with underlying low serum cortisol levels that responded to treatment with mineralocorticoid antagonist. This case highlights the various endocrine abnormalities other than the raised serum cortisol that can occur in patients with CSC.